You are here: Home / Soccer / Club Soccer / Premier League: No Way Back For Chelsea? Premier League: No Way Back For Chelsea? LONDON, Sporting Alert – Chelsea’s defeat against Everton at the weekend saw the defending Premier League champions sitting in an unfamiliar spot in the table standings. Three defeats in the opening five games have the Blues resting 17th in the Premier League table. Manager Jose Mourinho believes the dream of winning back-to-back titles has already disappeared, as no team with the record of Chelsea after five games in a Premier League season has ever come back to finished higher than third in the table standings. And it could very well be true, given the positive start from title rivals Manchester City, who have already won all five of its opening games and lead Mourinho’s side by 11 points. Despite side-stepping questions about some of his under-performing superstars and pinning the blame for his team’s horrific start on everything but the players – the Portuguese coach is clearly far from satisfied with the current situation at Stamford Bridge. It’s obvious that Mourinho isn’t too pleased about missing out on signing the players he wanted in the summer, and after watching his side falling 3-1 to Everton in the last fixture, and seeing targeted defender John Stones excelled in his position for the hosts, the former Real Madrid boss was again left frustrated. Chelsea has conceded 12 goals in the English Premier League from five games this season, which is the joint highest by any returning champions. The Blues have also let in two in five consecutive games, while allowing 16 goals in their last 7 Premier League contest. This is one more than Mourinho’s side conceded for the entire 2004-05 season and there are many who think the backline is no longer stable enough to stop teams from bullying them around. A lot of fingers were pointed at Branislav Ivanovic after he delivered yet another below par performance and was very poor on defense for two of the three goals scored by Steven Naismith. Many Chelsea fans, football experts and pundits think it’s time for Mourinho to drop Ivanovic. It was also a difficult time in the back for veteran John Terry and youngster Kurt Zouma, who found the challenge a little steep when trying to keep up with the high tempo of Everton. Mourinho also has problems in the midfield, as besides Nemanja Matic, no other player really played like they deserved to be on the pitch. Cesc Fabregas, who was leading the assist chart at this point during the season last year, hardly got involved, while the impacting Eden Hazard continues to struggle to find his dominating form from last year. Mourinho’s obsession with John Obi Mikel is still puzzling, as the holding midfielder is no longer an asset the club. He was a mere dot on the pitch this weekend against Everton and should not have even been in the match day squad. 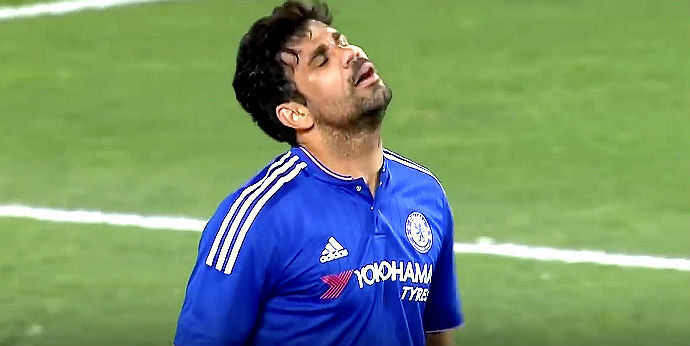 Striker Diego Costa is also fighting to get back his 2014 form. At this period last season the Spain international had already scored seven EPL goals, including a hat-trick against Swansea City. At the moment, he has one.